My friend recently asked me for the recipe for our pancakes. Here it is, Stephanie! Mix together dry ingredients. Stir in the egg, melted butter, baking soda and salt. Whisk together, adding extra milk for the desired batter thickness you prefer (I only need to add extra when I use rice flour). Gently stir in chocolate chips last. This recipe was adapted from one of my favorite websites, Heavenly Homemakers. She has them listed as Simple Soaked Pancakes and soaks them. I don’t typically soak mine because honestly I forget to. Make sure you go over and check out her site. She has a ton of great recipes and tips! I never realized how hard eating Paleo would be! We did okay. We’ve have, however, discussed it and we’ve decided we’re going to set some smaller goals and work our way up. This week we’ll eat Paleo Monday through Friday, then take the weekend off if we want. We are eating some dairy as well. Thursday – City Group. We’re bringing a side dish, not sure what yet. Wow, it has been a long time since I’ve posted! In that time frame we have moved back to Indy because we feel this is where we belong. God has given us a heart for this city and we want to help. 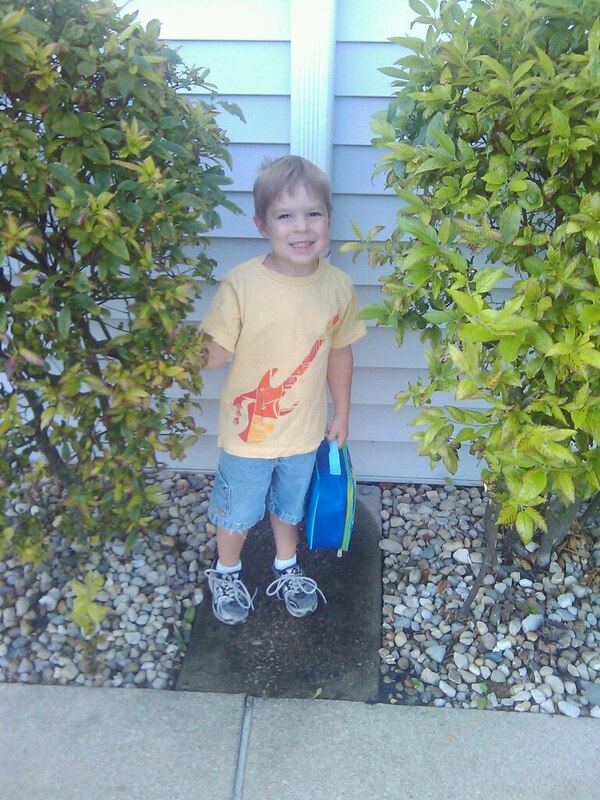 Joey also started home schooling for kindergarten and Eli is attending preschool where Joey went. It’s an exciting time in the Kiefer household! How are things going in your house? Any exciting news in the past three months I should know about? Eating gluten free is not always easy but when you or a family member have an allergy, intolerance, or celiac disease it a necessity. Here’s a few tips for anyone else in the same situation as us to help stay on a budget! -Focus on using naturally gluten free foods. Keep in mind that most meat and produce are naturally gluten free with the exception of some marinated and deli meats. Beans and rice are another great naturally gluten free option and they are cheap, especially when bought in bulk. -Buy local. Find a farmer’s market or a farmer who will sell to you directly. Local produce is always cheaper and you’re helping the local economy. You can usually find beef at a great discount by buying at least ¼ of a cow directly from the farmer. It may seem like a big investment but it will save you money in the long run. Buy a whole chicken and cook it all at once. One of the easiest ways is to use your slow cooker. Just place the chicken in the slow cooker on high for 4-6 hours and it’s done! Serve part of it for dinner, shred the rest, and freeze for meals like fajitas, tacos, soup, and so on. -Make your own gluten free flour mix. Buying the mixes at the store can get really expensive! You can find many gluten free flour mix recipes online. One of my favorites is using 2 parts rice flour and 1 part sweet sorghum flour. Then add xanthan gum or guar gum depending upon what you’re making. If you’re making bread and pizza dough recipes add 1 teaspoon xanthan gum or guar gum per cup of flour called for in the recipe. If you’re making a cake, muffins, or quick bread add 1/2 teaspoon xanthan gum or guar gum per one cup of flour used in the recipe. If you’re making cookies you do not need to add any xanthum gum or guar gum. -Make gluten free foods in bulk. Did you know that pancakes, muffins, breads, cookies, and pizza crust free really well? Once a month or as often as you like make up a few batches of your favorites from scratch. Then all you have to do is warm up what is necessary and you’re good to go. -Use coupons. If there’s something you really like then use coupons. Most companies offer coupons on their website or by joining their mailing list. If you don’t see the option on your favorite companies website send them an email. Sometimes it’s hard to find the sign up page or they don’t advertise it. Who knows you may get a good coupon in the mail from them! 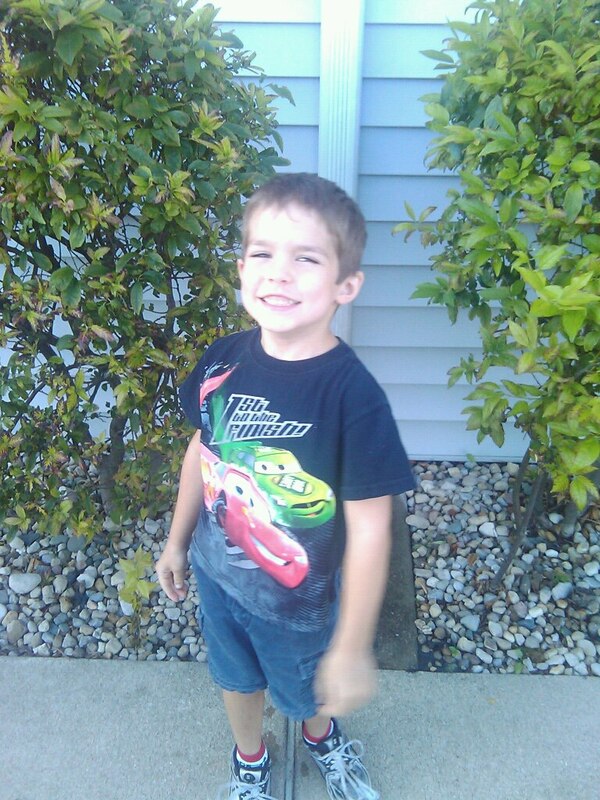 I woke this morning to our 3 year old, E, screaming at me, “I pooped in my pants!! !” On a very positive note he is still in pull ups at night, but don’t get too excited about that yet. I am changing him and he informs me, “I got poop on the floor.” Oh, and not just any floor mind you this is the living room carpet floor that was changed before we moved in. Beautiful. While cleaning up crap, literally, I am telling myself, “You are so grateful that God gave you a healthy boy that can poop on the floor.” Whew, done. Thank you, God, for allowing the creation of baby wipes they made my job a little easier. Time to make some coffee and get the breakfast going. I walk into the kitchen to find that E also must have been playing in the kitchen because there is a poop trail. Upon further inspection he was playing in the water, which I assume he pulled over a chair to get from the kitchen sink. The water was all over the kitchen floor, but am I just grateful this floor isn’t carpet too!! It took me so long to clean up all the kitchen floor my adorable children are “dying” of thirst and hunger (why yes, I am being sarcastic). They beg me to feed them and let them have some tea. Of course, being the loving mother I am I give them an apple and cereal because cooking is completely out of the question at this point! The apple and cereal work out just fine, and then, ah, then the tea. I take out the pitcher while walking on my nice clean, shiny floor (thank you, son) and pour three glasses of tea. Yes, three. After the morning I’m having I am thirsty too! I sit down the 3/4 full two gallon tea pitcher on the counter, or so I think. In reality I miss and the WHOLE REMAINING AMOUNT OF TEA goes all over the kitchen floor. B-E-A-utiful. My once clean floor is now sticky and brown. I get it clean and now we have a clean floor once again. And I am happy to say nothing else major has happened to our floors today (we won’t discuss the rest of the house). With all that madness I can still say thank you, Lord, for allowing me to have raise these amazing young men for you! Motherhood isn’t easy by no means, but who wants an easy life? I know I don’t! Sure maybe the first few weeks would be nice but then it would get super boring. Life is about surprises. Sometimes they are good and sometimes they are not so good. Just take a sigh of relief knowing that you’re not alone. God is right there with you and I in all the mess to carry us through and love on us. Now that IS beautiful! I will not be shopping this week because we spent all (okay, over) our budget last week. These meals will mostly come from the pantry and freezer, with the exception of a little produce left from last weeks delivery. We will be getting another $150 on Friday and plan to hit up Kirkwood Farmer’s market on Saturday. I am hoping to find cheaper meat there. We shall see. Grocery money is going to be tight for a while. I will have $150.00 biweekly to spend. We get a medium produce basket from Connie’s Green Grocery biweekly for $40.70 and it is a TON of organic produce. If you live in the St. Charles county I highly recommend checking them out. Also, please note that our menus are gluten free even if I don’t specifically say it. This menu isn’t for an entire week because I will be posting a new on on Monday or Tuesday for next week. Sunday: Lot Family, we are bringing hash-browns. If you see something and you want to know how I make it just ask. I am always happy to share recipes. While we’re speaking of sharing what did your menu for this week look like? If you have a blog please feel free to link it up in the comments section. I just wanted to apologize to anyone who has been watching for a new post. We did not have internet for a few weeks but we are back up and running now! I hope to post tonight or tomorrow and then on a consistent basis once again. Thank you for your patience. Have a blessed and wonderful day! Since our family has went gluten free one thing I have really missed is biscuits and gravy. It was a staple in our home growing up. A yummy, delicious childhood memory. Last week while making homemade cream of mushroom I had an epiphany. This could work with sausage in the same way! I tried it and an oh my yum! It worked beautifully. The following is my recipe modified from the Heaven Housewife’s recipe, which is linked above and Mom’s biscuit recipe made GF. Preheat oven to 400. Mix together flour, baking powder, and salt. Cut in butter with a fork. Add milk and mix. If mixture seems dry you can use the other 1/4 cup of milk. Grease a pan (I use Pirex). Drop biscuits onto pan and MAKE THEM TOUCH each other. Bake for 15-20 minutes or until golden brown at 400. Brown your sausage in a nice big skillet. I like to use my biggest iron skillet. While it’s browning shake cornstarch in a jar with 1 1/2 cups of milk. 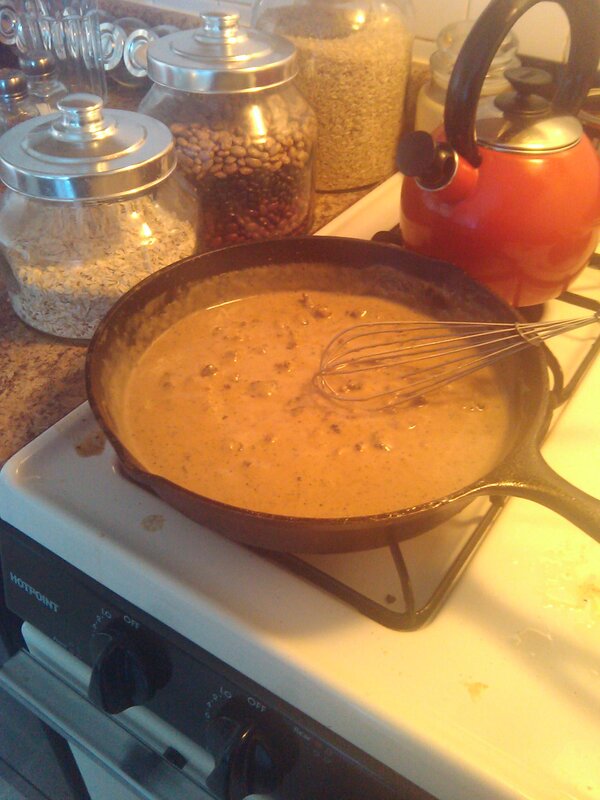 Use a whisk to mix the milk mixture into the browned sausage with grease., stirring constantly at medium heat. Slowly add remaining milk, salt and pepper. Stir with a whisk until smooth and thick. Pour over one of your amazing biscuits and eat your heart out!